Zealandia, formerly known as the Karori Wildlife Sanctuary, is a protected natural area in Wellington, New Zealand, the first urban completely fenced ecosanctuary, where the biodiversity of 225 ha (just under a square mile) of forest is being restored. The sanctuary was previously part of the water catchment area for Wellington, between Wrights Hill (bordering Karori) and the Brooklyn wind turbine on Polhill. Most of New Zealand's ecosystems have been severely modified by the introduction of land mammals that were not present during the evolution of its ecosystems, and have had a devastating impact on both native flora and fauna. The sanctuary, surrounded by a pest-exclusion fence, is a good example of an ecological island, which allows the original natural ecosystems to recover by minimising the impact of introduced flora and flora. 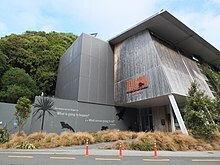 The sanctuary has become a significant tourist attraction in Wellington and is responsible for the greatly increased number of sightings of species such as tui and kākā in city's suburbs. Sometimes described as the world's first mainland island sanctuary in an urban environment, the sanctuary has inspired a raft of similar projects throughout New Zealand, with predator-proof fences now protecting the biodiversity of many other areas of forest. Examples include the 7.7 hectare lowland podocarp forest remnant of Riccarton bush/ Putaringamotu, the 98 hectare Bushy Park and, the 3500 hectare Maungatautari Restoration Project enclosing an entire mountain. The "Natural Wellington" project identified the reservoir catchment as having special significance because it is a large self-contained habitat suitable for a wide variety of native plants and animals. In 1993 a feasibility study was carried out by the Wellington regional and city councils and after public consultation in 1994, the idea of a sanctuary was given the go-ahead. The Karori Wildlife Sanctuary Trust was formed in mid-1995 to implement the proposed 'mainland island' wildlife sanctuary. The most crucial aspect of the sanctuary is a pest-exclusion fence, designed to exclude fourteen species of non-native land mammals ranging from deer to mice, which encircles the 8.6 km perimeter of the Sanctuary. Construction of the fence was completed in late 1999 and all mammalian pests within the perimeter were then eradicated over a nine-month period. This predator-proof fence is of great conservation significance, being a world first. 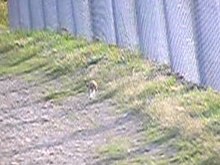 Stoat running off after being unable to find a way through the fence. The fence design was arrived at after trials with the various species to be excluded. Its main features are a small mesh size (to exclude animals down to the size of a mouse), a curved top-cap (to prevent animals climbing over) and an underground foot (to prevent animals burrowing underneath). In terms of its meeting conservation goals, the sanctuary has met with considerable success due to the design of the perimeter fence. The fence and ongoing monitoring have successfully kept the sanctuary free of all but the smallest species – the house mouse. 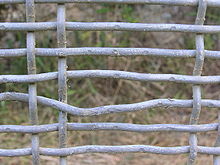 It is thought that small defects in the fence mesh (damaged during construction) allowed mice to re-enter the sanctuary. Modifications to the fence have been considered in an attempt to permanently exclude mice, but meanwhile, mouse numbers are monitored and controlled. There have been occasional breaches of the fence by weasels and rats, these occasional incursions are not unexpected (for example resulting from storm damage bringing trees down upon the fence), and are picked up by on-going monitoring with tracking tunnels. The flora and fauna in the sanctuary are recovering from its pre-managed degraded state. Although the original primary forest has been regenerating since 1906, it is still only in the early stages of succession with small hardy trees such as mahoe dominating. Members of the original flora that are missing from the site, or rare, include large podocarp species such as rimu, matai, miro, kahikatea, and totara, are being re-established. Northern rātā has also virtually disappeared from the valley and a number of seedlings have been planted. A wide variety of native trees, of benefit to native fauna, is already present including a mature colony of the New Zealand tree fuchsia, Fuchsia excorticata. 70 tuatara, Sphenodon punctatus, from Stephens Island (released December 2005). ^ "Wildlife reserve our new Zealandia". The Dominion Post. Fairfax New Zealand. 3 December 2008. Retrieved 1 October 2010. ^ Helen Clark (7 December 2005). "Karori Wildlife Sanctuary Trust 10 year anniversary". www.beehive.govt.nz. Retrieved 1 August 2017. ^ Kate Guthrie (4 August 2016). "Doing the sums – what are the best predator control options?". Predator free NZ. Retrieved 1 August 2017. ^ Bain, Helen (November 2006). 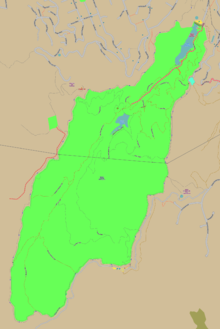 "Natural Capital". Forest & Bird. Royal Forest and Bird Protection Society of New Zealand Inc. (322): 33–35. ISSN 0015-7384. ^ a b c New Zealand Historic Places Trust. "Lower Karori Dam". The Register. New Zealand Historic Places Trust. Retrieved 1 August 2017. ^ "The New Reservoir". LXXV (62). Evening Post. 13 March 1908: 3. ^ Lynch, Jim (February 1995). "Back to the Future". Forest & Bird. Royal Forest and Bird Protection Society of New Zealand Inc. (275): 12–19. ISSN 0015-7384. ^ Lynch, Jim. "Jim's story: the founding of Karori Sanctuary Trust". www.visitzealandia.com. Karori Wildlife sanctuary Trust. Retrieved 25 November 2015. ^ a b "Zealandia Karori Sanctuary Wellington New Zealand Our Fence". Karori Sanctuary Trust website. Karori Wildlife Sanctuary Trust. 2011. Retrieved 1 August 2017. ^ David Attenborough (November 2000). State of the Planet. BBC Natural History Unit. Retrieved 15 July 2011. ^ McIntosh-Ward, Nancy (9 July 2004). "Karori Wildlife Sanctuary Biosecurity Programme Detects Weasel". Press releases. Karori Wildlife Sanctuary Trust. Retrieved 1 August 2017. ^ "Sanctuary showdown: intruder apprehended". Press releases. Karori Wildlife Sanctuary Trust. 22 February 2008. Retrieved 1 August 2017. ^ Romijn, Richard (22 December 2004). "More species of lizards found in Karori Wildlife Sanctuary". Press releases. Karori Wildlife Sanctuary Trust. Retrieved 1 August 2017. 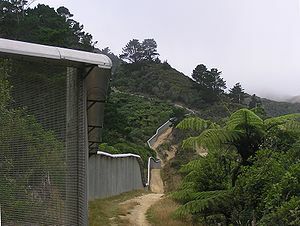 Wikimedia Commons has media related to Karori Wildlife Sanctuary. This page was last edited on 11 April 2019, at 13:04 (UTC).